(Photo: REUTERS / Stringer)Paramilitary policemen patrol along a street in Shenzhen, Guangdong province, May 27, 2014. 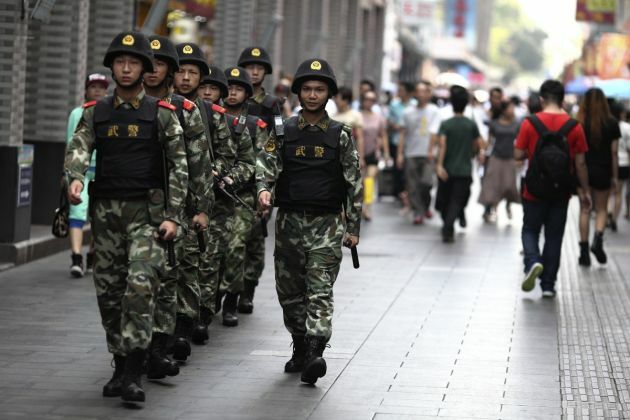 China has announced a year-long anti-terrorism operation in Xinjiang, home to a large Muslim Uighur minority, as well as nationwide, following a series of bloody attacks that Beijing blames on Islamists and separatists from the region. Picture taken May 27, 2014. Chinese Muslims in the Western region of Xinjiang are distressed because they are banned from fasting during the holy month of Ramadan. Xinjiang is home to the mostly Muslim Uighur community, one of China's 56 recognized minority ethnic groups. Three Muslim students told the BBC they were forced to have meals with professors to make sure they were not fasting. 'No teacher can participate in religious activities, instil religious thoughts in students or coerce students into religious activities," said a statement on the website of the "Number 3 Grade School" in Ruoqiang County in Xinjiang, Al Jazeera quoted the AP news agency as reporting. Students told the BBC that fasting for Ramadan was banned in all universities across the region. "If you want a normal life here then you'd better not fast," a student said. During Ramadan fasting is obligatory for adult Muslims, except for those suffering from an illness, those travelling, pregnant and breastfeeding, women, diabetics or women during their menstruation period. Several of China's government departments are also enforcing the fasting ban. One government hospital reportedly, had a Muslim staff member sign a written pledge promising not to fast. In a video interview with France 24, one Muslim said, "at my work, my boss asked me to not practice Ramadan...we have less freedom to practice our religion." Sha Zongping, Islamic Studies Professor from Beijing University, admitted there is discrimination against Muslims because of lack of knowledge of Islam in Chinese society and biased media coverage. The Washington Post reported in a July 11 blog that the recent Ramadan crackdown had to do with current politics and violent attacks China attributes to jihadists in Xinjiang and Central Asia. On Thursday, courts in Xinjiang handed 32 people prison terms for downloading or sending "violent terror" videos. The suspects were found to have used phones and the internet to store, download, and spread religious extremism and terror. Many Uighurs, however, say that violence is rooted in Beijing's repression of their cultural and religious beliefs. China is officially an atheist country. It has faced accusations of persecuting religious groups like Christian "house churches" and the Falun Gong spiritual movement, along with Muslim groups.